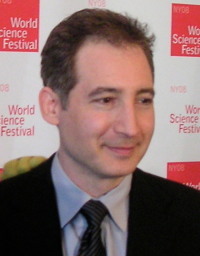 Another speculation produced by Brian Greene’s The Hidden Reality: Parallel Universes and the Deep Laws of the Cosmos . Imagine the universe was infinite (along the “quilted multiverse” pattern – namely that it streched on and on and we could only see a part). That would imply, assuming that the “cosmological principle” that one bit of the universe looked like any other, applied, that there were an infinite number of hydrogen atoms out there. For any given electron the probability in “most” regions of space is zero in any measurable sense. But if there are an infinite number of electrons then the probability at a given point that there is an electron there is infinite, isn’t it? OK, I have obviously got something wrong here because nobody is dismissing the “quilted multiverse” idea so simply – but could someone explain what it is I have got wrong? Update: Is this because space-time is a continuum and the number of electrons a countable infinity?